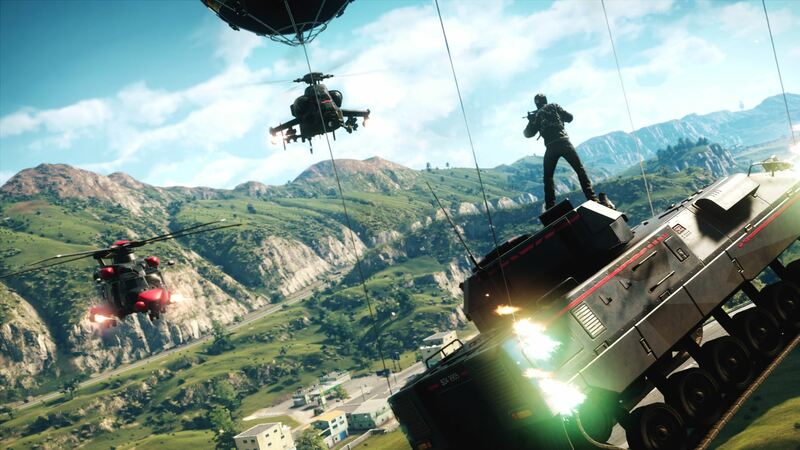 Just Cause is a series that deserves a bigger audience than it has historically commanded. The various tales of Rico Rodriguez may not be profound or particularly memorable, but his explosive exploits are always incredibly fun and provide hours of entertainment. 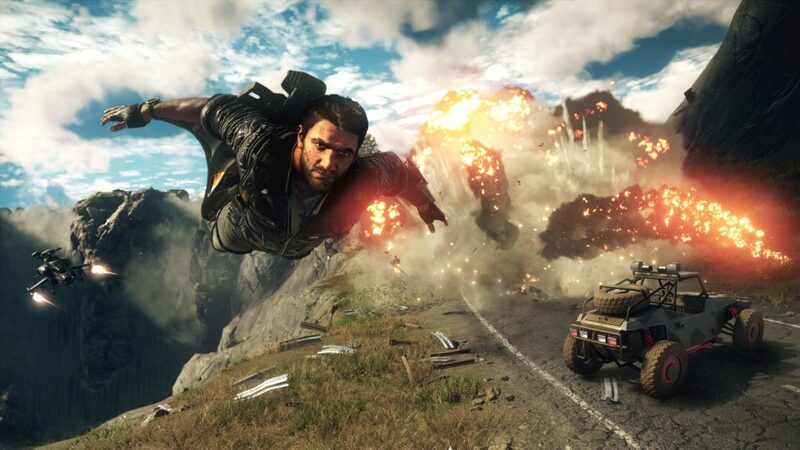 Alas, the very late timing of Just Cause 4’s arrival may not help in gaining new fans, but its an early Christmas present for those willing to give it a try. Within an hour of playing, I had scaled the side of a mountain and took on dozens of gun-toting militia. I had been in a high-speed chase, shooting out the tyres of pursuing vehicles and watching them somersault through the air before exploding, Michael Bay-style. I had commandeered a tank before shooting down enemy helicopters and destroying a host of other tanks and APCs that came down on me like a tonne of bricks, then been forced to escape through careful use of my parachute and Wingsuit, even evading missiles as I glided through a rainforest. But most importantly, I watched Rico make a Batman-like entrance during one early cutscene, in which he took down an attack chopper and an entire enemy squad without even pausing for breath. If any of that sounds even remotely like something you would enjoy, then yes, Just Cause 4 should at the very least be on your radar. 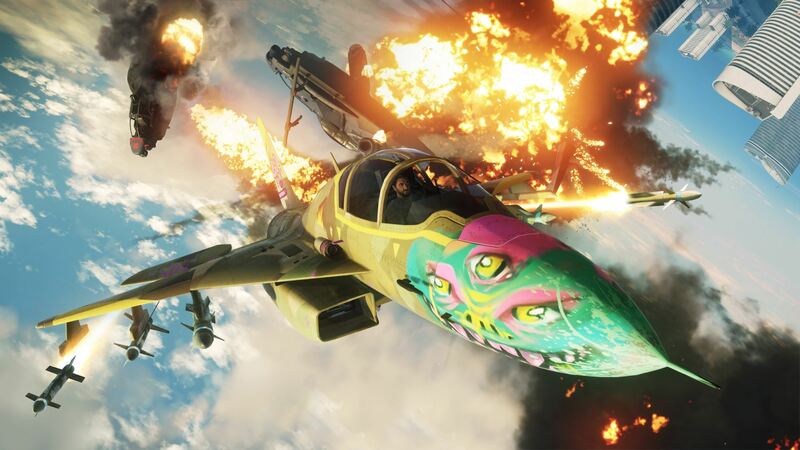 Much like any self-respecting Eighties action movie, Just Cause 4 begins with a corporate big shot with a megalomaniac complex, who just so happens to own a weather-manipulating superweapon called Project Illapa (pronounced “ee-yappa”). Obviously, it’s up to our wise-cracking (but troubled) hero to save the day. How does Rico Rodriguez do this? By accidentally doing the aforementioned Batman entrance that kick starts a rebellion. It is both ridiculous and awesome in equal measure. You’ll unlock squads as you do rescue missions and the like, which will help you to push your rebellion into enemy territory and slowly begin to take back control of the fictional country of Solís from the Black Hand militia. You will see all this via the in-game map screen, which is unnervingly large when you first take in the sheer scale of it. It was at around five hours in when I first noticed, seeing that I had only really pushed my forces out to occupy around a quarter of the whole island. The series has always been pretty hefty in size, but it still managed to surprise me. In truth, the island is too big for the content on offer. Sure, there are speed stunts and other assorted challenges packed into every square inch of the place, but they don’t really stop the island from feeling a bit empty of proper things to do. I know advertisers love that whole “the world is massive” bullet point, but there’s rarely anything of note happening despite the number of people and vehicles milling about the island. It feels a little lifeless. Thankfully, a couple of hours in you will unlock fast travel, but that is limited to having available pilots to literally drop you at your chosen location. Once used, that particular pilot will have a cooldown period before they can be called again. 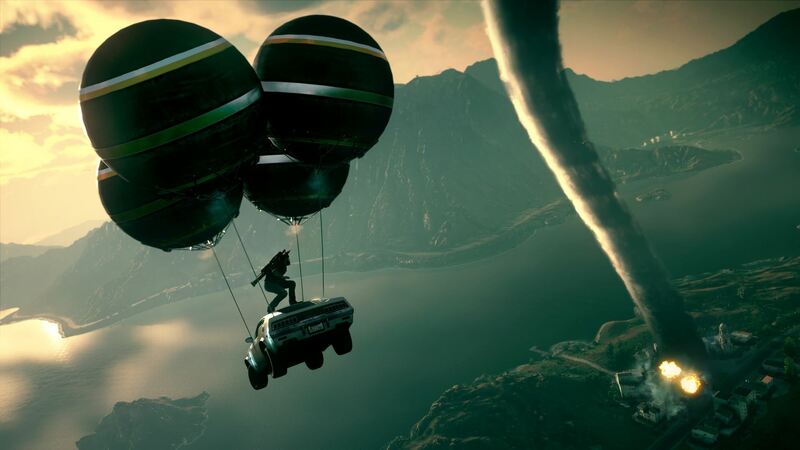 While there is a certain realism to this, in a game where you have an infinitely redeployable parachute and Wingsuit; and you can grapple onto absolutely anything, well… realism just isn’t Just Cause 4’s thing. That said, you’ll rarely need to fast travel more than once at a time, but those pilots can also drop off weapons and vehicles so it’s wise to keep at least one free, just in case you find yourself in need of some firepower or an escape vehicle, in the middle of a dicey situation. Just Cause 4 isn’t just about basic shootouts, though. You’ve probably seen the trailers with Rico on the edge of a tornado and (honestly, this comparison even surprised me) the whole thing reminds me of Breath of the Wild. Yes, seriously. The Divine Beasts had their own epic and unique setup before you actually got into their quests proper, and Just Cause 4 has a similar idea. I won’t spoil things for you, but my first foray into the extreme weather scenarios revolved around lightning storms, and those are particularly explosive. While trying to activate a bunch of lightning rods, a huge electrical storm rolled in and was frying everything in sight. Careful and frequent use of Rico’s toolset are essential to avoid being fried like a steak, all while avoiding hails of gunfire and falling helicopter wrecks that had been destroyed by the storm. It was madness, but that gloriously over-the-top style is what it’s all about and this fourth outing has really turned it up to eleven. The tornadoes are where things get really interesting, mind you. Battling waves of enemies, including vehicles like tanks and helicopters, all while parts of buildings and trees are sucked up into oblivion? It’s a seriously impressive spectacle, reminiscent of Hollywood’s biggest set-pieces. Again, at one point I saw a tornado on the horizon as I was trying to evade a pair of jet fighters that were chasing my helicopter. Of course, I decided to see what happened when I went into the storm, and when I saw entire structures being dragged up into the tornado, I knew it would be a struggle. I don’t think I’ve ever seen such a feat in a game like this, and it’s always cool and exciting to see. Even the smaller parts of the game are fun and ridiculous, with some of the grapple gun’s features offering daft fun as always. You can still drag enemies around using tethers, or send them careening into explosive barrels with a tether that reels things together at high speed, but what about attaching balloons to them (and their vehicles) and watching them float into the sky? Pennywise would be proud. What isn’t particularly fun is the repetitive mission structure. It’s a good job that the general action is so unrestricted, because there’s only so many times you can activate three switches or protect an uplink dish while your friend Izzy hacks something or other. It grows a little stale when you have to go do one of these identikit missions in order to unlock the next story mission, because it wants you to push the front lines further inland. It makes sense in story terms of course, but sometimes you just want to progress without the obvious filler content. I must confess to growing even more tired of these events than usual, thanks to the PC version I played crashing quite regularly. The checkpoints are very forgiving, meaning that if you had activated two of the three switches in a side-mission, you will still only have to activate the third switch upon reloading your game. That softened the blow somewhat. If it crashes during a story mission however, you’ll be starting the whole thing again. You can accept a few flaws in games like this, because the rest of the game is so fun and explosive. Just Cause 4 is the pinnacle of the series so far, with some of the most impressive action sequences that are all the more mind-blowing by their inclusion in standard, open-world play. 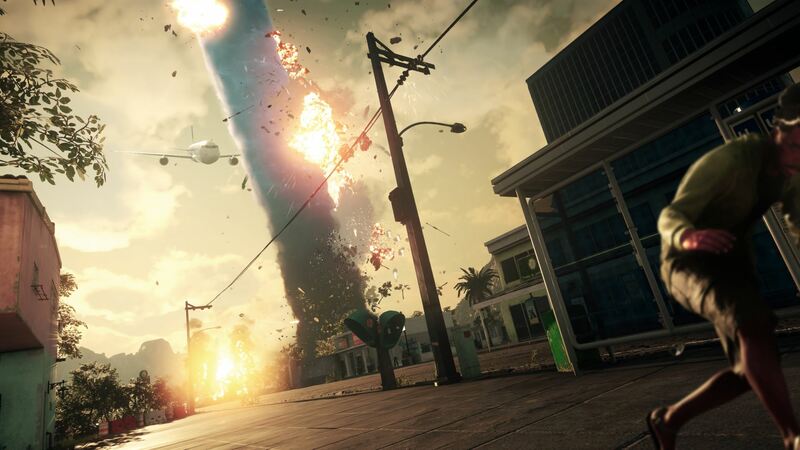 Tornadoes and more can spring up during your general travels, no longer confined to scripted set-pieces like most other action games, and I don’t care who you are, that’s just brilliantly ridiculous.